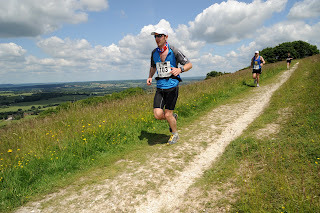 As tough as last year, terrain-wise, but fitter this year which showed with a time of 3:55:20, 12 minutes faster than last year and more importantly inside the 4 hour mark. 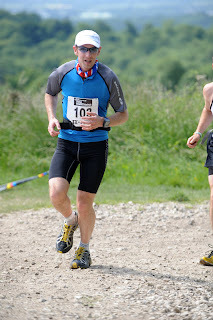 My biggest problems were caused by poor weather forecasting, which had most runners preparing for chilly conditions and rain and instead we had 19 degrees and dry hot conditions. This lead me to suffer from cramping at 21 miles as i didn't take any salt tablets with me and there were no isotonic drinks on the route. Not a problem for the MDS as i will have properly prepared for the conditions and be suitably kitted out. Apart from that it was a very enjoyable race in very nice scenery. Training has begun again (3 days rest after the Marathon) with little side effects apart from low glycogen stores which are being replenished, as i type (bagel with almond butter), so the next target of the Faversham Marathon in 6 weeks looks on target. Still nothing as regards to corporate sponsorship (tight !!!!!!!!!!!!!!) but hopefully something will appear or else the re-mortgage may need to be upped a little). Official training for the MDS starts week commencing 7th July as back-pack training begins and sights are set on that rather than the intermediate races in the run up, and i have just planned a 45 mile route for a run-walk day in mid August, which will give an indication on progress. Gait analysis being done this weekend as i think i may be starting to pronate, judging by the blister on the side of my ankle, so a change in running shoe might be called for. Anyway, better get back to work, and will trot back on in a months time for the latest update.